When we have friends visit that aren’t familiar with the area they’re always curious as to what kind of wildlife they can expect to encounter while they are visiting. While we don’t live in a “remote” area in the sense that we have homes surrounding us, to many people it’s still living “out in the sticks” because there are trees and it takes 15 minutes to get into “town”. Back when I first moved to the Poconos I lived a block over from Main Street Stroudsburg where you were close to whatever you needed, nightly runs to Wawa to grab a snack were common and life was convenient. Being that we were living in ‘the city’ essentially there was next to no wildlife roaming around except maybe a stray cat or dog. Shortly before our first son was born we moved a little bit further out to a place we rented that had a yard and a little bit more space. Deer and rabbits were a common occurrence, as we found out quickly after planting a bunch of flowers and vegetable garden, only to find out that our hard work was quickly chomped up by the local wildlife. It was at that point that we started investigating “deer repellent” plants, fenced in the garden and realized that things were a little different then living in the suburbs of Philly had been. A year or two went by and after house hunting for ages we finally decided to move out to Henryville which is about 15 minutes from both Stroudsburg and Mount Pocono. At the time it was a lifestyle change – we went from having access to stores conveniently at our fingertips at any time of the day, to adapting by making larger weekly shopping trips. Long gone were the days of “hey can you run down to Wawa and grab a gallon of milk” to “better get 2 gallons of milk because we probably won’t be out shopping again until the weekend”. In addition to the changes of lifestyle we found that we started to truly experience all of the wildlife and animals the Poconos has to offer. I experienced this first hand when we adopted a kitten and I thought that she had escaped somehow because I could not find her anywhere in the house. Heartbroken and frantic we scoured the neighborhood looking for her for a good 2 hours, and during that time I did not find our kitten – but I did find at least 5 others cats/kittens running about in the woods and yards surrounding other homes. After needlessly chasing cats that were not ours – we came home to find her in the closet, sleeping. She’s all grown up now so luckily we haven’t had to be on the lookout for cats – but from the pawprints of numerous cats that find their way under our decks every year, I know there’s still plenty of cats wandering around outdoors. One of the most easily spotted wildlife is Deer – and if you don’t spot them, they’ll be sure to spot you. Driving becomes downright dangerous in the fall as these friendly fellows wander through the streets and dart in front of cars. We had an unfortunate car to deer incident a few years back a little bit further up in NEPA and although we came out of it ok the deer did not, and the damage it did to the vehicle was quite extensive. If you’re not dodging deers in a car, they will be sure to come up and start nibbling at your Hostas and other plants as soon as the cooler weather (and even the spring) hit. Years of gardening has taught me to plant things they don’t like versus trying to keep them away from the plants they do like – because one way or another they’ll get a hold of them. 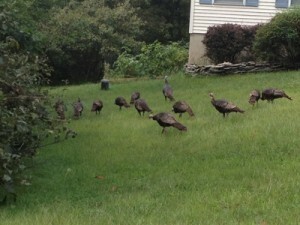 Although I seem them often throughout the spring and summer – just in time for Thanksgiving the Turkey seem to appear in droves. Most of the deer I come across aren’t really too concerned that there are cars or people around – the Turkey take it to another level though. They will stand 10-12 at a time in the middle of the road without a care that there are cars honking or people shooing them. Maybe they’re hard of hearing? Mysteriously they seem to disappear around Thanksgiving time – I’d like to think they go somewhere to hibernate – but not knowing the first thing about turkey, hunting laws or anything else – maybe they end up on someone’s plate for the holidays? The largest animal encounter we’ve found is our friendly neighborhood black bear – which I think we FINALLY figured out a way to get rid of once and for all. Every year for at least the past 5 years we’ve been visited by 1-2 black bears that will come up to the house usually first thing in the spring and fall to ravage our trash cans. At first it was surprising, slightly intriguing and not really a problem – but cleaning up scattered trash gets old really quick. As the years progressed the bears became less shy – appearing at dusk or even when it was still daylight and having our small children outside running around when a black bear is out, dangerous or not, is not my cup of tea. Numerous attempts at scaring them away over the years failed miserably – we tried “scenting” the trash cans to make them unappealing, we’d yell or make loud noises to no avail, and I banged pots and pans and the only thing that accomplished was destroying the bottom of the pots (not the smartest move). We have neighbors with big expensive trash bins to keep the bears out – but where there’s a will there’s a way and they had the same issues we did. So this year after some serious Googling we came across what I believe is the solution – a good old air horn. We purchased a “no need to refill – hand powered” airhorn for like $6 off Amazon and waited patiently for the bear to appear. After being awoken one night to the trash cans being knocked over and seeing our bear friend feasting, we put the air horn to the test. Unlike previous “loud noise” attempts – this scared the heck out of the bear who quickly ran to the woods bordering our yard. After another blow of the airhorn he/she was gone – and we haven’t seen them since. I still hear complaints from the neighbors so I know the bear haven’t left for good – they just haven’t been back to visit us since – it was surprising to me that after so many other “loud” noises that was what actually scared the bear. So make a mental note of that – because we’ve been hiking before and come across black bears – they always say to stand still, or make loud noises if they seem to be approaching – well now I know all I really need is an airhorn and I’m good! One animal that people are skeptical on is Coyote in the Poconos – I saw some last year running through our neighborhood (a very rare occasion) but there’s a lot of stories of people that have encountered them. I’m not sure why there is such a controversy – whether there aren’t’ enough documented, or not enough people have seen them, or they get dismissed as dogs. Whatever the reason may be, I don’t think it’s smart to approach what looks like a coyote running around and it’s just another animal that you should keep alert on when out and about in wooded areas. There’s so many different animals and wildlife in the Poconos that are abundant – snakes, toads, chipmunks, eagles and more – the list goes on and on – so next time you’re out and about in the Pocono Mountains take a minute to look around and you’ll be surprised as to all the creatures and critters you can find. Obviously you’re not going to find them on Main Street in Stroudsburg – but in almost any wooded area you’re sure to find something of interest. Just be sure to be aware of your surroundings when hiking or going off the beaten path – even the nicest of animals can be dangerous when provoked or scared. Personally I’ve found from observing the Pocono wildlife is that they could care less that you’re there – they want to be left alone as much as you do. So take a glance or a photo, respect them and their surroundings, and move on and most likely they won’t do much more then glance your way as well.